The first Tattersalls Ireland sale of 2019, the one-day February NH Sale, produced highly satisfying returns - the median that matched 2018's figure of €7,500, and an increased average of €11,516 (1%). The 36-lot larger catalogue produced an increased aggregate and the best on record for a one-day February NH Sale of €1,911,600 (+3%). 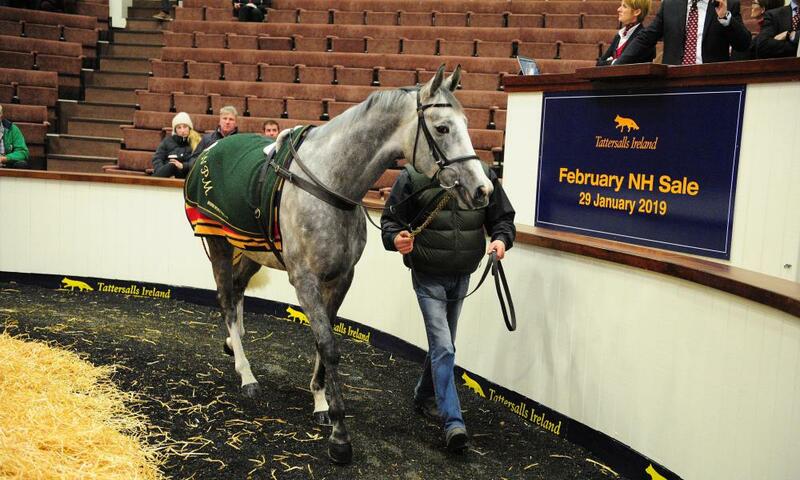 "He was a stand-out," said purchaser Katie Rudd, who had to go to €62,000 to acquire the February-born colt. "He is by a very good sire and has a very good pedigree." Joey Logan Bloodstock spent €60,000 on a Shantou colt out of the Oscar mare Ned's Joy, an own-sister to The Tullow Tank and a half-sister to the Grand National (Gr.3) winner Many Clouds (Lot 274) and €48,000 on a colt by Walk In The Park and out of the Listed-winning mare and the Gr.2 placed Stephanie Frances (King's Theatre). "Trade today reflected the strong market conditions of our November NH Sale. Trade was very strong where purchasers believed that the individual and the pedigree justified their valuations. The market continues to be selective at the middle to lower end. "With store sale inspections now at an advanced stage, nominations for both the May Sale and the Derby Sale will close next Monday, 4 February 2019."